The name Muskie (also known as Musky) is derived from the word Muskellunge. Esox Masquinongy is the scientific name of Muskie. The term Muskellunge came from the French word Masgue Alongé, which means “Ugly Pike”. In order to catch one of these top predators, follow our summer muskie fishing tips below. Muskies have only one species, but found in 6 different patterns that include Clear, Barred, Silver, Pure Leopard, Spotted Black Panther and Spotted Leopard. Spotted Black Panther is one of the rarest patterns and only found in Lac Seul. Pure Leopard is the rarest and only can be seen in few lakes in Ontario. Muskies are greatly affected by climatic changes and usually prefer stable weather. During the summer, Muskies become solitary hunters. They either rest at the bottom, or hide under the weed beds or near rock piles. Once the water temperature hovers around 60 degrees, they start moving towards summer territories. In early summer Muskies spend most of their time in shallow water feeding on ciscoes and whitefish. Late summer is the best time of the year to catch tiger muskies. They are on the go and generally very active during this period. They tend to react well to fast moving presentations and larger lures. Selecting the right weed beds is an important factor when looking for summer muskies. They are known to be top of the food chain predators and always looking for prey. That is why you need to choose weed beds which offer plenty of food options and space to move around. When choosing the lure, versatility is the key, especially during summer. The main reason behind this is that the Muskie becomes familiar with their surroundings, and more often, with our lure presentations. Trolling or casting bucktails, crankbaits, jerkbaits or large minnow baits are most effective when you are fishing around rock humps as Muskies stay on the shallow water, not far from the spawning area. Look for the emerging weeds patches, as these are known as musky hotspots. This early season weed growth means rising water temperature and bait fishes, it also offers cover for the muskies to hide in. Good lures to target fish around these early growing weed patches are bucktail spinners and minnow baits, especially in overcast days with little wave movement. The growing popularity of musky fishing and technological innovation has created an industry today that produce quality Muskie rods and reels which make your fishing job much easier. Some of the most popular summer Muskie fishing rods include Shimano Compre Muskie Rod, St. Croix Legend Musky Rod, and St. Croix Premier casting series. The reels that you choose are one of the most important components of your musky tackle, and can make a huge difference between a successful Muskie fishing trip or a disappointing one. Some of the most popular Muskie fishing reels includes Shimano Calcutta D Series, Okuma Isis Round Baitcast Musky Reels, Daiwa Lexa High Capacity Baitcast Reel, and Shimano Corvalus Round Casting Musky Reels. As the air temperature touches 65 degrees, muskies are scattered all over the lake. You will find them on the rocky piles, island clusters, rocky reefs, and cabbage weed beds near deep water. During peak summer, lake surface temperature hovers above 75 degrees; because of this reason muskies become very active due to high metabolism and feed more often than any other time of the year. During the day, they stay in deeper water. Trolling with deep running plugs or large bucktails is the most effective way to cover a lot of area. The ideal speed for trolling in the summer should be 6-8 miles per hour. Be sure to use a top electric trolling motor for best results. For a better result you need to troll fast with a long line along the weed beds near deep water. It also helps to use a portable cheap fish finder to determine water depth and temperature. With rising water temperatures, evening and early morning is the perfect time for fishing as deep water muskies move towards shallow water weed beds to feed on the baitfish. Night fishing with large spinnerbaits or top water lures can give you the desired result. Warm surface temperatures, strong winds, and sunny days make the summer most productive time to fish Muskie. If ice fishing is more your thing, be sure to check out our post on picking the best ice shanty. Fishing is not always easy, which is part of the appeal. Getting out on the lake or hitting the river can be enjoyable, whether or not you catch any musky, but it is definitely more worthwhile when you get to take home a giant tiger muskie. Having the best muskie rod and reel combo can make a big difference in your success and enjoyment. Ask any angler and you will learn that the musky rod and reel combo that you use will go a long way towards increasing your ability to catch large musky. I have tried a large number of different musky rod and reel combo units for catching tiger muskie and have a few pointers for you. When looking at the best muskie rod and reel combo reviews, keep in mind that there are a number of factors to consider. You need to look at the main features of the musky rod and reel combo and compare several different models. Here are some tips to help you find the best muskie rod and reel combo. A long muskie rod length is needed for more stability when fishing for musky. Musky are big fish and require a strong rod. You will also need a suitable line capacity. Anything above 12 pounds could be adequate. However, we recommend line with at least 80 pound test. A good gear ratio will make it easier to bring in your line. When you have a large tiger muskie hanging from your line, you do not want to have to struggle to reel your line. For more information on fishing line selection and rod and reel reviews, check out our friends over at http://tigermuskie.net/. They are a great resource for all things muskie fishing. 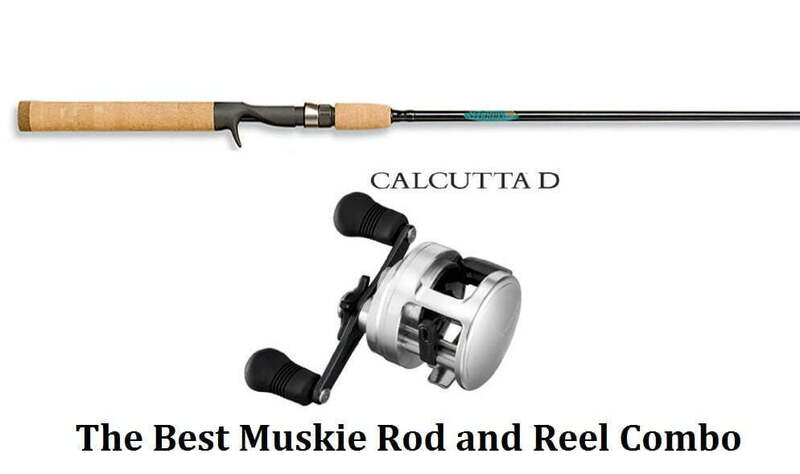 The top muskie rod & muskie reel combo has two primary components – the rod and the reel. Start with the rod. Find a rod that is both durable and flexible. A little bit of flexibility will help with your maneuverability when reeling in large fish, such as tiger muskie. After finding a suitable rod, the next step is to look at the reel. Make sure that the musky rod and reel combo that you choose contains a high-quality reel. The reel should be durable, stable, and rigid. When you are ready to start searching for the best muskie rod and reel combo, you should find a combination that meets all of your requirements. Look for a long rod, around seven feet in length, that is made from durable materials and capable of resisting corrosion. The muskie reel should be capable of supporting a long line, if you need to reach deep depths. Tiger muskie are known to inhabit weeds and rocks, where they can remain hidden. You need a musky rod and reel combo that you can use without worrying about your line getting snagged or stuck in a tight spot. Purchasing the best muskie rod and reel combo can increase your chances of heading home with a trophy tiger muskie. After years of trying various musky rod and reel combos, I have come to the conclusion that the St. Croix PC70MHF rod and reel combo is one of the better choices; though, there are many other options available. The St. Croix PC70MHF rod and reel combo includes finely tuned actions and tapers for superior fishing and is backed by a 5-year warranty. As you begin your search for the best muskie rod and reel combo, keep the tips we’ve mentioned in mind. Try to find a combination that has a long, stable rod that can offer flexibility and a musky reel that makes it easy to bring your line in. When you make the right choice, you will be amazed at how much easier it is to catch a trophy tiger muskie.